The Kaiserliches Zeughaus or Imperial Armoury is sometimes called "Bürgerliches Zeughaus" or "People′s Armoury" - which are two names that sound conflicting to me and I haven′t succeeded yet in making sense of this. There is also a neutral third name: "Unteres Arsenal" or "Lower Arsenal". Whatever you call it, the Zeughaus is situated on the Am Hof Square and now used as an arsenal for the Vienna fire brigade. Ironically, the building was on fire in 2007. Not the only disaster of recent years: In 2006, a crane fell on the roof. The building was seriously damaged and the crane operator killed. The first armoury on this site was built in 1562. The land had previously been part of the Jewish district. In addition to the armoury, the building also housed firemen even back then. Under the guidance of Count Montecuccoli, the building was re-furbished and extended in 1677. It also served for the construction of large guns and artillery. Certainly a good idea to have such a building - thinking of the Turkish siege of 1683. If you stand in front of the Kaiserliches Zeughaus, have a look at the building to its right hand side: On its façade, there is a gilded cannon ball of the Turkish army, which was found in this building after the Turkish defeat. The Zeughaus itself was constantly developed and extended: Between 1714 and 1723, it was widely rebuilt under the guidance of the "Kaiserlicher Fortifikationsbaumeister" (Imperial Fortification Builder) Donato Felice d′Allio. 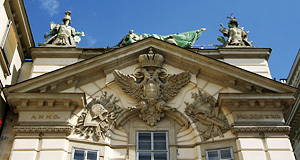 The strangely opulent and over-laden façade was extended in 1731 by Anton Ospel. He also messed around with the roof and added two allegoric figures, representing persistence and strength. Attractions nearby include the other sights of the Am Hof Square: The Kirche am Hof, the BA-CA-Kunstforum and - around the corner - the Palais Ferstel and the Schottenstift Abbey. The Minoritenkirche Church is within walking distance. In the other direction, you find the Böhmische Hofkanzlei on the Judenplatz, with the Museum Judenplatz and one street on, the Altes Rathaus and the church Maria am Gestade. Going towards the Stephansdom, you will get to the Graben. Here you can find the Peterskirche Church.